We know we need to do it. Yet this knowledge and the good feelings afterward aren’t always motivation enough to follow through, especially in summer. The excuses are abundant, but the only thing that really works is to ‘just do it’ as the saying prompts us. We all need to just exercise. 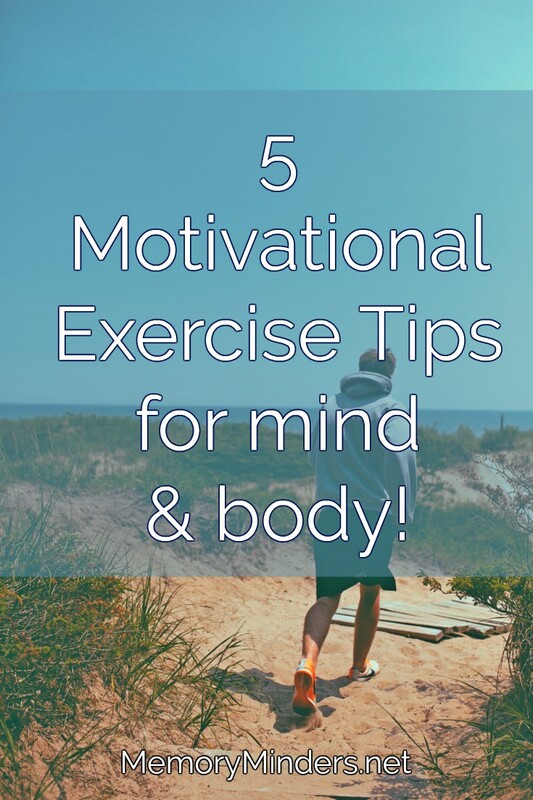 Continuing our month long theme of highlighting behaviors we can all change toward our mind and memory wellness, this week it’s all about exercise. Our bodies need physical exercise daily. If we don’t move our bodies, the muscles, bones and all that makes our bodies function well will weaken. We used to be able to ‘exercise’ by doing our daily work. But today’s sedentary lifestyle hinders us from getting enough exercise in our daily lives. So we need to make a behavioral choice to exercise. I struggle here too. I don’t love the ‘exercise class’ experience. So I do my own thing to exercise. But this just provides more opportunities to slack off. But learning how much physical exercise helps mind and memory wellness has provided some additional motivation. A plethora of research links exercise to mind and memory wellness. It’s now a common fact: exercising strengthens not only our bodies but also our minds. It provides the additional blood flow to help grow and maintain brain cells and their connections among other numerous benefits. Countless studies list exercising as we age is one of the most important things we can do for our mind and body wellness. Do it first thing in the AM, when possible. Doing this sharpens my mind to tackle anything in the day ahead. Make it an appointment. Think of it as a commitment to yourself. Lately, with the heat of summer, I’m exercising in the cool of the evening. It’s a refreshing change, but also can be more difficult to stick with as the day and my energy wanes. Don’t be tempted to slacken-keep the commitment, your body and mind will feel good and benefit! Try new ways of exercising. My go to exercise is a brisk walk. But sometimes, it’s just not as exciting as other options. Summer is a great time to get back on a bike, go for a canoe or kayak ride, swim or play a fun physically active game with kids. Mix it up and it won’t seem like a chore to exercise. Set a goal. Do a community walk or set a step or minute goal, but give yourself something concrete to strive toward. I utilize a heart rate tracker to maintain my heart rate level in the ‘cardio’ zone or higher. I utilize numerous mini-goals to maintain or break each time I walk. Whatever exercise I’m partaking in, I aim for at least 150 minutes a week of cardiovascular exercise as recommended by the American Heart Association. Plan ahead. This is key, especially when busier or lazier summer days tempt us to skip exercise. Think about how to fit it in before the day begins to achieve a higher chance of success. Exercise is a lifelong habit which provides so many benefits mentally and physically. Don’t just sit there in the lazy days of summer. Get up, be active and exercise! *Always check with your doctor before beginning any new exercise regimen.